It is possible to look after your home and reduce the amount of allergens that you are exposing your family to, on a daily basis. I am not perfect, I still like carpet in my home and if it costs money, it isn’t for me. However, putting that aside, it is important that I reduce the potential of allergens as most of them are dust mites and that does just creep me out completely, the idea of creepy crawlies wandering around my home doesn’t make me feel good at all and I do everything in my power to keep them at bay and that means I have to clean! But I clean to reduce allergens in my home and not to spread them around. I know that carpet is a breeding ground for these little animals and that does creep me out, but thankfully I have a dog that loves to share her fur and this makes me vacuum on a daily basis and it attacks these dust mites that might try to live in my carpets. I also try to clean them regularly; I have a thing about smells and because we have two dogs I worry that my home smells like a dog and that makes me clean the carpets on a regular basis. Dirt comes into the home on the bottom of our feet and on our clothes and this is why I do try to insist that shoes come off when you come inside and inside slippers aren’t worn outside. This is to try to prevent the spread of germs, pollen and other items coming too far into my home. In the summer we have to watch the dogs; they love to sniff and they go under bushes and become little pollen catches, we wipe this off to prevent it being spread indoors and affecting the two hay fever sufferers. I do have a lot of tiled areas downstairs and this is great; a quick damp cloth and the removes the dust without spreading it around the house, which is what happens when you sweep or vacuum these floors. I don’t use polish when I am cleaning anymore, I use a damp cloth, this normally has a slight hint of my vinegar and water solution and this removes the dust without flying it around causing the spread of dust and germs. If you are looking to reduce the allergens in the air then it is important to control the growth of any mould; through moulding food, which isn’t the best, poor circulation or a leak in your home. It is important that you address mould as quickly as possible as some mould is dangerous to your health. Bleach will clear it quickly but it will return, if mould is on your windowsills then this is a sign of poor ventilation. Everyone wants to seal up their homes to reduce the amount of energy lost, unfortunately with that, homes don’t get the required ventilation to prevent the growth of mould. You must either keep on top of the mould or find ways to ventilate your home more. If you have mould on your walls, it is important to identify the source in case there is a building issue, which you need to address. Mould can grow because of food particles being left out, wash dishes daily and empty your bins, this reduces the potential for the food particles to break down and turning into mould growth. There are many ways that you can reduce the number of allergens in your home by the way you clean. I have noticed my husband’s allergies have reduced since I have stopped using chemical cleaners around the home, I am not adding to the pollutants and I am reducing the airborne particles by not flicking more dust around. Therefore, I feel that my home is getting healthier and cleaner for my family and I hope I am reducing the amount of creepy crawlies that tries to take up residence in my home. So, for me, it is important to clean to reduce allergens in my home and not make it worse by not cleaning in the right way. 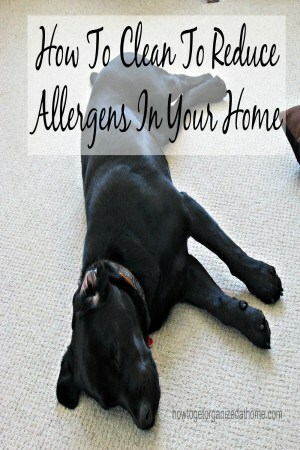 What is your best tip to clean to reduce allergens in your home? 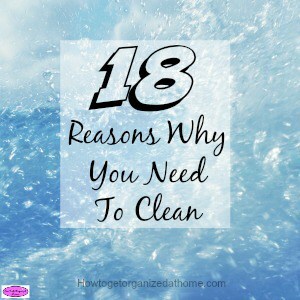 I wrote an article that I think you will like, 18 Reasons Why You Need To Clean, it can help to motivate you to clean! I have carpet in my bathroom, (WHO thought THAT was a good idea????) I want to get rid of it as soon as possible!